Over the last couple of weeks, the Cassini imaging team (and, to a lesser extent, the other instrument teams) have been cranking out image releases, celebrating both the recent Iapetus flyby and the ten years since Cassini's launch. These piles of extra image releases are almost all jaw-droppingly beautiful; it would seem that it's hard to take a bad photo in the Saturn system, but, truth be told, such beautiful images also require a lot of hard work on the part of imaging team members. 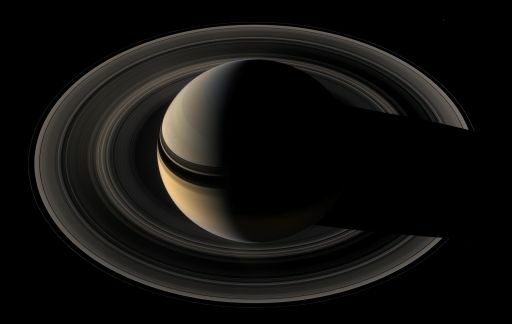 Color images are a special challenge because Cassini is in constant motion, so as it takes each view through different-color filters, its vantage point on the planet, moons, and rings changes slightly. Making color views requires careful registration of these multiple single-filter images, often with stretching and resizing. In some cases, particularly with images of moons captured during close flybys, planar stretching and resizing isn't enough; the images have to be tagged with detailed geometric information and then ground through software that reprojects the images, figuring out where each pixel falls upon a shape model of the moon, and then flattening the images back out into a common geometry. It's finicky work, and it takes patience and skill. I couldn't possibly post all the beautiful images in one day, so you'll probably see them coming out in batches. To begin with, here's another one of those top-down global views of Saturn; Cassini took many of these over the first few months of this year. The global view below wasn't on my previous list because it was taken later, in May, as Cassini was starting to crank its orbit back down toward the ring plane again. 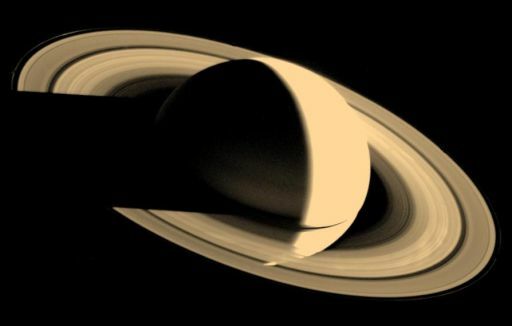 This view of Saturn nestled among its rings was taken on May 9, 2007 from an elevation of 39 degrees above the ring plane, on the shadowed side of the rings. A total of 45 images were required to make up this view. Three of Saturn's moons are visible in this image: Mimas at the 2 o'clock position, Janus at the 4 o'clock position and Pandora at the 8 o'clock position. The shadows of the rings have moved significantly southward since Cassini arrived at Saturn; the planet will see its equinox in 2009. In one of the iconic images of the Voyager mission, Voyager 1 gazed backward on Saturn as it sped away from the system on November 16, 1980. Saturn was Voyager 1's last encounter. From a vantage point about a million kilometers away and 39 degrees below the ring plane, Cassini scanned across the unlit side of Saturn's rings, acquiring images through multiple color filters. Images taken through red, green, and blue filters have been combined into this approximately natural color panorama, which shows details as small as 6 kilometers across (which is much larger than any of the individual particles within the rings). Because the light is shining from the back of the rings toward Cassini, parts of the rings that are mostly transparent but contain lots of fine dust, like the F ring and the Cassini division, are particularly bright. Another global view of Saturn is notable because it includes nearly all of Saturn's large moons. From a distance of roughly three million kilometers (two million miles), Cassini contemplated almost the entire system of Saturn, its rings, and its moons. From left to right, the moons are: Dione; Enceladus (just to the left of the rings); Mimas (just above the rings in front of the ring shadow on the left side of Saturn); Rhea (at roughly 11:00 at the edge of Saturn's disk); Tethys (to the right of and slightly above the rings); and finally orange Titan (lower right). Only one large moon is missing from the view, Iapetus, which lay almost directly behind Cassini when this family portrait was taken. I posted an amateur-produced version of this image earlier, and received several emails telling me it would make a great panoramic poster. I agree! The rings one would be a great poster, too. For comparison, here's the previous, amateur version of this image, made by Gordan Ugarkovic. It's interesting to compare it to the official version. The official version was made with the original spacecraft data; Gordan's version was made with the JPEG versions of these images posted on the Cassini website. Gordan's version looks washed out, and Titan is too bright, but there's really not much to be done about that, because the JPEG versions posted on the Cassini website have all had an automatic contrast stretch applied to them that tends to over-brighten lighter areas in images. Now, that contrast stretch is a good thing for the public who view the raw images, because it makes features in the images easier to see, and makes the raw images more intelligible. But it makes things hard for people like Gordan who want to make beautiful color pictures. This is the compromise that has been made on both Mars Exploration Rover and Cassini raw images; the contrast stretch and JPEG compression, applied to all images before their release, reduces their quality a bit, making them significantly less valuable for scientific research, but hardly reducing their value at all for public enjoyment. To produce images as lovely as what comes out from the Cassini team, you have to wait for the proprietary period to expire and for the team to archive the original, official data on NASA's Planetary Data System. That usually takes roughly nine months, so there's now well over two years worth of high-quality image data available in the Planetary Data System for all you image junkies out there to play with. Anyway, these are just a couple of the amazing pictures released this week; I'll get to more of them in future posts.